I suspect that this recipe currently applies to maybe like one person who reads my blog but hopefully it will be one of those things that, if eventually you find yourself in a position of needing it, you'll be like, "Wait a second...I saw this recipe one time..." and you'll come back and find it and it will help you out. I've mentioned approximately 20,000 times here that I'm nursing. I haven't talked much about it specifically, but I will say that it's never been a real easy thing for me. Stinky never got it and my supply tanked hard and early. He was 100% on formula after 6 weeks, despite my best efforts. Baby 2 loves nursing but he wasn't getting enough. Some women are made to be producers and they struggle with an over-abundance and engorgement while I am one that has to fight for every last ounce and it shows in my kid's itty-bitty-ness. At his 6 month appointment he was so small that the doc was like, "um...this baby needs CALORIES." So I got him really started on solids (you should see him eat. I think he was starving) and got working on increasing my supply. A lot of women swear by drinking a good dark beer but that's not on the table for me. I knew there had to be something specific in the beer that made it work and I doubted it was the alcohol. So when I found this recipe and saw that it contained brewer's yeast I thought, Bingo. 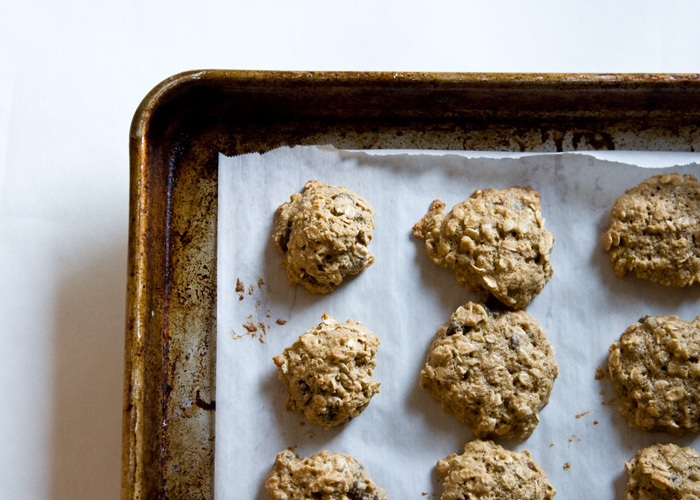 These cookies are chock-full of all the stuff that, in theory, should help up your supply. Oatmeal, flax seed, brewer's yeast, and calories. I made mine pretty small so I could just kind of snack on them throughout the day. Each cookie is about a level tablespoon of dough. Let's just say I made these on a Saturday and by Tuesday I was...overflowing. Baby 2 started acting content and full after feedings instead of annoyed that there wasn't more and I was able to pump plenty for an upcoming vacation. These won't win any taste awards or beauty contests but they actually aren't as bad as I feared when I first tasted the dough. The flavor of the brewer's yeast mellows a lot with baking and Aaron and Stinky both really like them too (which of course leads to lots of joking inquiries as to how their supply is doing). I made some adjustments to make them a smidgen more healthy but you can find the original recipe here. 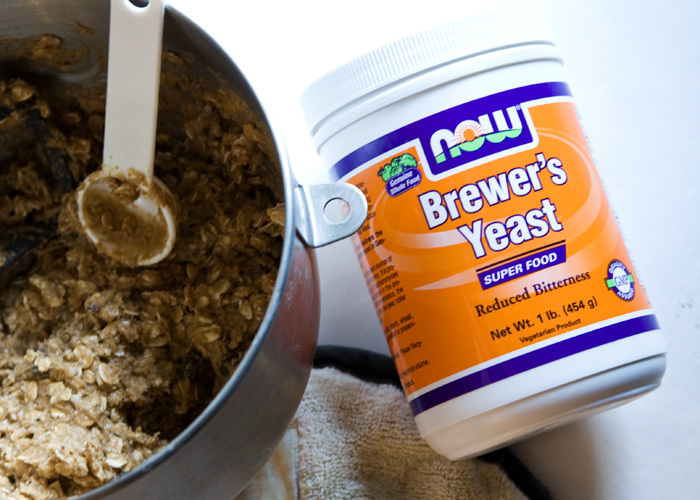 Update October 2014: You can find brewer's yeast at most health food type stores. My regular grocery store didn't carry it but the GNC next door did. Preheat oven to 350. Mix flax seed and water and let sit for 3-5 minutes. Beat together butter, applesauce, and sugars. Beat in eggs. Add flax seed mixture and vanilla and beat well. In a separate bowl, stir together the flour, baking soda, salt, brewer's yeast, oats and chocolate chips. Mix in to wet ingredients. Scoop on to parchment lined baking sheet and bake 10-12 minutes. Store in an airtight container or freezer. Good to know! I currently seem to have plenty, but with two, I worry that as they eat more we'll have a supply issue. I will definitely tuck this into the future reference folder of my brain. Thanks! Glad I am not alone! I totally starred this. Like you say, some day I might say, "now where is that recipe..."
I'm making them (well, my own modified version) right now! I can't wait for the results. I'm kind of sick of wasting time pumping for barely anything. And I'd really like to be able to go on a date with my husband!!! I'm making these tonight. Just found out C gained 6 ish OUNCES in 2 months. And I've been pumping for 2 days to see how much I make and clearly it is not enough. How on earth was T so huge? Hope it works for me! That looks great! I am sharing this with a friend.